The Dogs emerges from vivid childhood recollections of being chased by dogs. The area that I grew up in was full of pawnshops, mechanics and cheap car yards, which meant a lot of barbed wire fences and angry dogs. I was terrified of dogs, they represented boundaries guarded with a savagery that I wasn’t prepared to tackle as a child. Dogs are a ubiquitous part of the urban landscape in Australia, every yard seems to be patrolled by something grunting and menacing behind the fence. There was the fear of dogs as unpredictable and territorial but there was another level of fear that prickled my skin. Dogs are considered unclean animals to Muslims, unless they are kept to perform utilitarian tasks of protection and hunting they’re not considered as suitable human companions. For me, that was the role they played, only I was cast in the role of the transgressor, the hunted. Worse still, black dogs are considered as the representatives of Satan, the embodiment of evil. The agency of culture casts a long shadow over what could be seen as a benign aspect of daily life, a dog is a part of the family pack afterall. Ingrained fear focused the protective nature of these guard dogs as something far greater than territorial, it was as if they could smell my soul. While the work is rooted in these childhood memories, the use of dogs to control people and protect the rights of a ruling class has a deep rooted history in colonial and counter revolutionary oppression. Exploiting the predatory instincts of dogs in the service of human masters, they have become synonymous with closed borders and the violent exclusion of entire groups of human beings for arbitrary reasons. The work juxtaposes this idea of territorial exclusion within a glittering, aspirational domestic space described by the chandeliers. It promises an ideal that can never be accessed from the outside, a gaudy beauty that belies the underlying violence of social divisions. 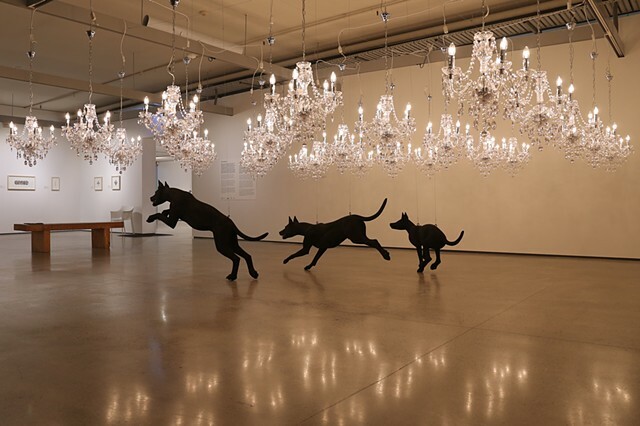 I encourage audiences to walk under the canopy of low hung chandeliers, the reduced space is intended to direct attention into engaging with the dogs from a more vulnerable posture, approximating the height of a child.